Page 58 Item 1 of the first of Teresa Vanderburgh's Musical scrapbooks - pamphlet for musical instruction offered by Angelo M. Read, Director of the Buffalo Vocal Society and the Central Church Choir. Date Unknown. 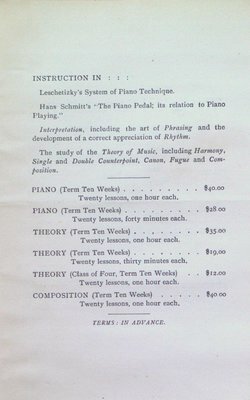 Listed is the various music lessons and instruction offered by Angelo M. Reed.